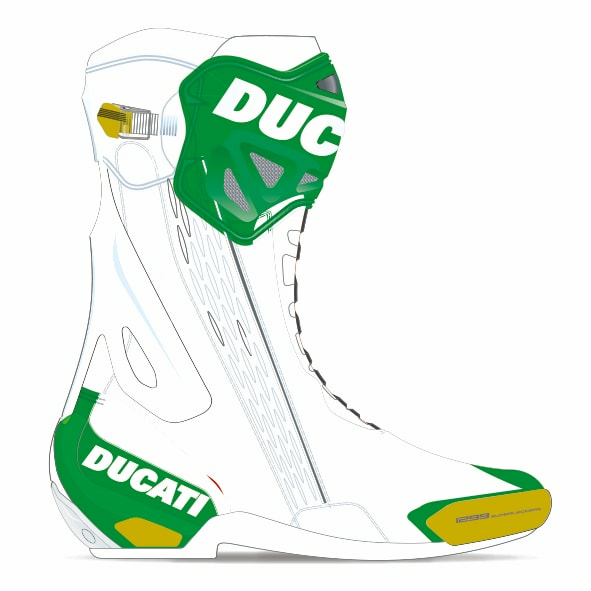 The Ducati Corse V3 boots, made in partnership with TCX®, set new standards of comfort and protection for track riding. The light and durable microfiber upper is equipped with the Double Flex Control System, a protective structure in polyurethane with a slim profile designed to adhere to the boot shaft. Two ribs running along the back of the boots provide for a controlled flexibility of up to 13°, preventing the risk of hyperextension of the joint. Comfort and protection of the tibia are ensured by an over-injection on elastic material, while the inner side of the boot, customized with a technical drawing of the 1299 engine, has a surface that provides grip without any protrusions that could get caught during a fall. In fact, the boot's closure is positioned on the outer side. An effective calf adjustment system, the sole integrated into the boot design, magnesium sliders, and an internal lacing system with quick scrolling strap complete the overview of these top-of-the-range sport boots. Inner protection in chamois for maximum grip.